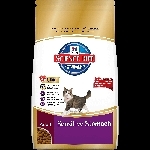 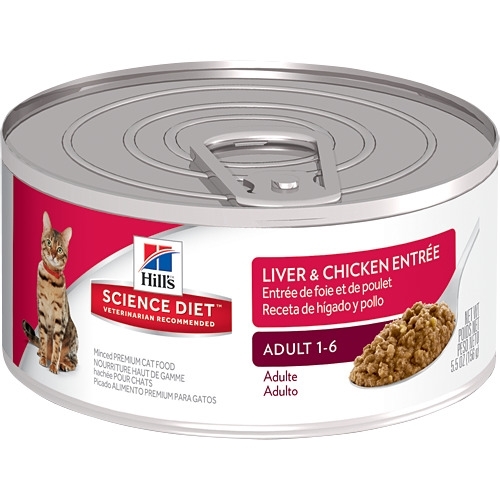 Science Diet™ Adult Liver & Chicken Entrée cat food brings together two flavors most cats find too tempting to resist in a soft, smooth texture. 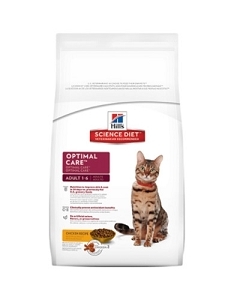 It has precisely balanced nutrition to maintain lean muscle and vital organ health. 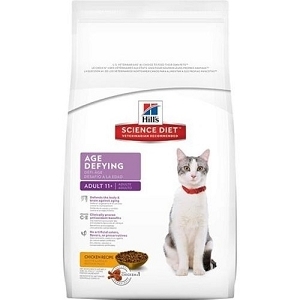 Water, Liver, Meat by-products, Chicken, Ground Whole Grain Corn, Wheat Flour, Corn Starch, Powdered Cellulose, Chicken Fat (preserved with mixed tocopherols and citric acid), Chicken Liver Flavor, Rice Flour, Calcium Sulfate, Guar Gum, Brewers Yeast, Locust Bean Gum, Caramel Color, Potassium Chloride, Carrageenan, DL-Methionine, Calcium Carbonate, Dicalcium Phosphate, Choline Chloride, Taurine, Vitamin E Supplement, Iodized Salt, Thiamine Mononitrate, Zinc Oxide, Ferrous Sulfate, Niacin, Pyridoxine Hydrochloride, Manganous Oxide, Copper Sulfate, Calcium Pantothenate, Vitamin B12 Supplement, Riboflavin, Biotin, Vitamin D3 Supplement, Calcium Iodate, Folic Acid, Sodium Selenite.